Welcome to HATCHBOX 3D Products Our engineered filament is here to help you stream your creative outlet, enabling you to see your thoughts and concepts engineered into a real and rewarding reality. The filaments are universally designed and compatible with 3D Printers using 1.75mm diameter filament, with a dimensional accuracy of +/- 0.03mm. 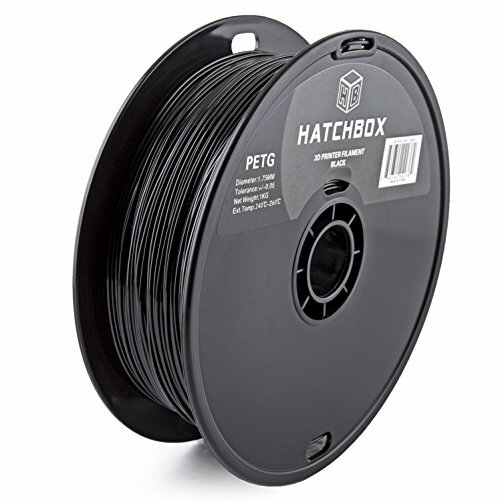 Perfect for strength and flexibility, HATCHBOX’s PETG, or Polyethylene Terephthalate Glycol-modified filament, is a great alternative to ABS or PLA filaments. PETG filaments can be processed over a wider processing range than conventional PET filaments and also offer a good combination of properties such as toughness, easy bed adhesion, and stiffness. The 3D printed object will have a glossy type finish with PETG. Why we love it: Hydrophobic Easy adhesion to a number of surfaces Environmentally safe No heating bed required.